Last year, we invited drpoplove to help our followers to improve their game. This year, we will do it again. He is a former #1 FIFA and FIFA Street player in the world, and he will explain everything you need to know to improve your FIFA skills. 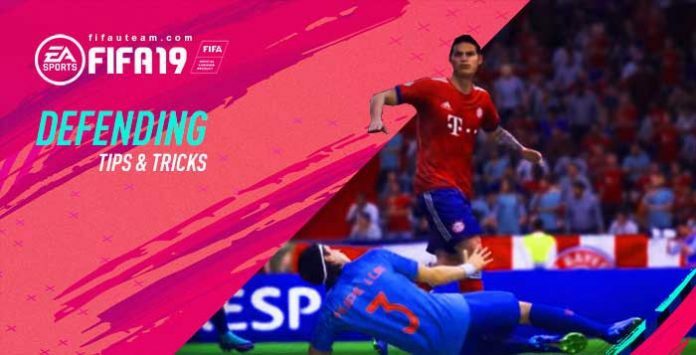 Today, he will show you what’s different with the FIFA 19 Defending and what you have to do to defend better. Hey comrades, defending in FIFA 19 is a little better than in 18 due to player responsiveness and AI positioning. A lot of the same defensive skills from last year will translate to a degree, and I’ll do an updated defensive tutorial as the actual meta evolves. But for now, let’s refresh with 5 tips that will help you regardless of the state of the meta, server delay, etc. When you’re defending, you never want to create pockets of space for the enemy to exploit. But too often you’ll find your midfielders in awkward positions, leaving massive gaps. Thankfully there’s a player instruction that helps maintain your shape in FIFA 19. You can tell central midfielders to cover the central areas of the pitch, and by default they cover the wings instead. It’s a lot easier to maintain your team’s shape if you don’t have players drifting wide all over the place. By raising the skill gap on tackling (regardless of whether you like the mechanic or not), the game seems to promote a more fluid build up. And it means that smart defending gets rewarded… In theory. Based on my experience so far, I highly recommend setting your mids to defend centrally. It’s easier to funnel someone to the wings than it is to defend massive gaps in the center of your half. I know it’s tempting to immediately go after the guy who has the ball, but that’s not always the best course of action. If you’re controlling a CB and you vacate his position, you now have a clear gap to goal. So if you’re going to charge the ball carrier, you better be 100% certain that you’re going to get that ball. Playing a high pressure system requires a lot of focus, and if you’ve never done it before, you can tell your team to “press after possession loss” in the custom tactics. Your team will press hard for about 7 seconds and then revert to normal. But generally speaking, don’t just immediately charge the ball carrier unless you have identified that you have a realistic chance of getting the ball back. And how do you figure that out? Trial and error of course! Slide tackles take forever and leave you exposed. You can tap the slide tackle button a 2nd time to get up faster, but you still end up exposing yourself massively if you don’t win the ball back. Pretend that slide tackling doesn’t exist unless you have literally no other options, or unless you want to commit a dirty foul to break up a counter attack. Defensive agility/responsiveness in 19 is better than 18, but they’re still defenders. You should try to avoid sprinting with them whenever possible, because sprinting with a defender means committing 200% to one specific direction. If you need to chase the enemy attacker down, obviously you have to sprint in order to catch up, but don’t bother sprinting if you’re in front of the attacker and only need to cover a little bit of ground. Once a bunch of defenders have IFs and and crazy special boosts, sprinting and agility are less of an issue. Sometimes, you don’t even have to make a tackle to win the ball back. In fact, this way of defending is preferred by many all time greats like Maldini and Ferdinand, and it does translate into FIFA somewhat. Positioning your players in ways that can cut passing lanes or in ways that simply get in the attacker’s way is a great way to pressure the enemy into making a mistake. Tackling requires timing and animations to finish, but good positioning is eliminates that variable. To get good at positioning, I recommend watching your own replays to see where and how an attacker beat you. You’ll start to recognize patterns and adjust accordingly. That’s it for today comrades, let me know if you have any questions! Cheers. I keep losing games because loose balls from my players after being tackled and falled down like a wood stump and no foul, or when I’m dribbling towards goal and when I shoot on goal, the balls is wide or ridiculously shot. Pressing is something that when other team uses, nobody on my team get a successful pass anymore, and opponent players drain energy and still runs like Bolt. I’m hating this game. No more passing and creatin plays, just cheeky commands to win. Two tips: perform all defending tutorials; use your custom tactics to keep your defensive line back and don’t forget to use at least on CM with defensive skills.